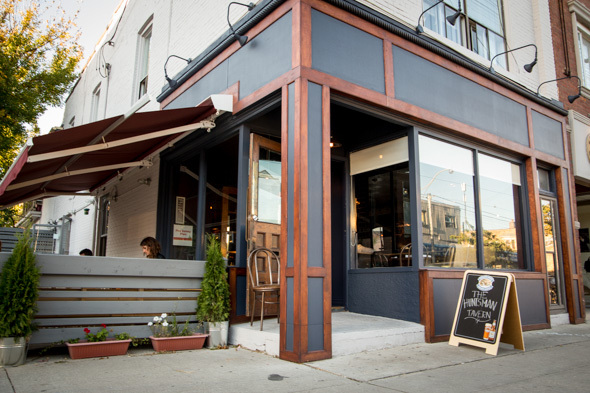 The Huntsman Tavern has opened at 890 College St. (between Ossington and Dovercourt), in a space that has not had much luck in the past ( Mitzi's , Red Fish ). Given our first impressions, one can hope that is all about to change. 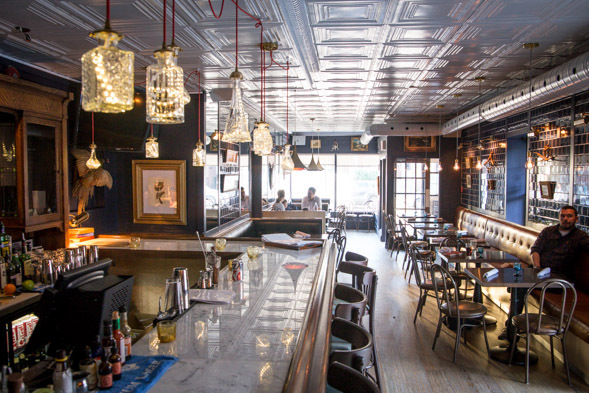 Owners Nick Savage ( Redlight ) and Saeed Mohamed ( BQM Burgers ) have done a excellent job taking a spartan room and filling it with curios and neat design touches. The lamps above the bar, made from vintage crystal decanters, are a particularly nice addition. The menu, designed by chef Mike Tan ( Oddseoul , The Saint ), has done an amazing job of combining soul food with French and British comfort fare, with some added finesse. 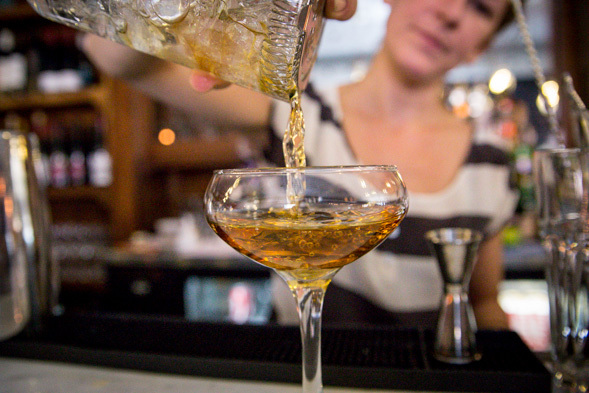 The short cocktail menu is just as interesting, designed and run by veteran bartender extraordinaire Aja Sax (The Emerson, County General ). We started our visit with a drink from the cocktail menu. The Scotchy Scotch Scotch (they have quite a few drams on hand) was a blend of Ballantines and Bowmore 12 year scotch whiskies, with maple syrup and Coster's RX blackstrap ginger bitters ($14). Essentially it's a scotch old-fashioned served up, with some nice smokiness from the Bowmore. I can imagine myself looking forward to this kind of thing on a cold and dreary evening as the fall becomes winter. 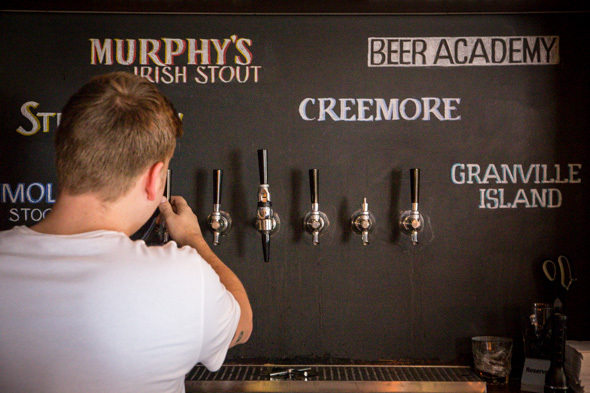 Also on offer are a range of beers on tap and a short but varied wine list. The Crispy Wings ($8) are three whole wings, smoked and fried in the housemade bbq-chimichurri sauce, and served with a side of 'Sri-ranch-a' sauce. 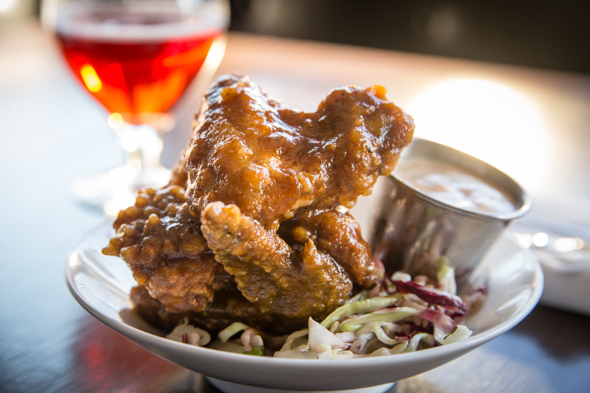 The wings fall off the bone and have a sweet and herbaceous quality. When dipped into the Sri-ranch-a it adds a touch of heat and creaminess, which rendered them difficult to share. 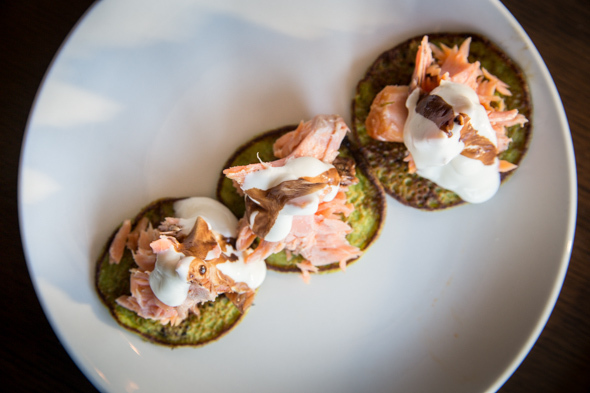 The smoked trout cakes ($10) are served on a pea blini and topped with creme fraiche and a touch of balsamic reduction. All the flavours complement each other very nicely and the trout was moist and tasty. Given the hefty fare elsewhere on the menu, it was a refreshing break to have something that didn't fill us up so much. If you're going to order across the menu, it's worth bearing this in mind. Given the city's obsession with Korean Fried Chicken lately (no bad thing in itself), I was happy to see something a bit more traditional in the Two Piece Fried Chicken ($16, lead photo). Both the thigh and leg are slow-cooked sous vide, before being fried in a buttermilk batter and accompanied by a house made cheddar topped biscuit, sausage gravy, and a cabbage, green apple and dill slaw. The slaw is absolutely fantastic, and I was dismayed to see that it's not offered as a side (at least on the menu, anyway). We finished up with the Tourtiere hand pies ($12). Not seen on menus in the city enough (in my opinion), the Tourtiere is the Mack Daddy of meat pies. 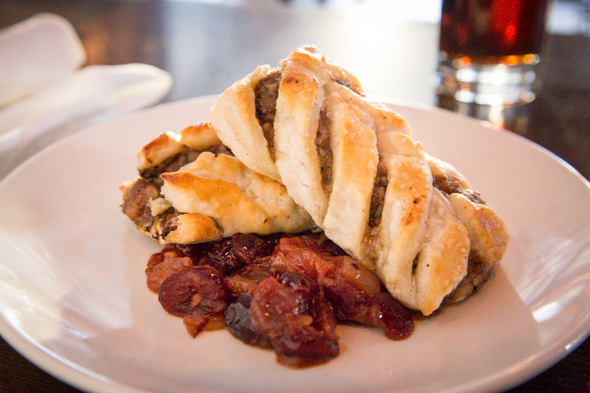 These smaller versions are with made with pork and wild boar and wrapped in a beautifully flaky tallow crust, and a side of cranberry relish. The Hunstman is open for lunch Mon-Fri 11-3pm and for dinner from 5-11pm with a snack menu in between from 3-5pm. They also serve brunch on weekends from 10:30am - 3:00pm which will be run by former Hadley's owner Eric Hadley, and they'll also be doing late night snacks from 11pm-12am Thursday through Saturday (when they will be serving booze until 2). They even do family-style carved roasts, with all the accompaniments for those who fancy booking 3 days in advance. 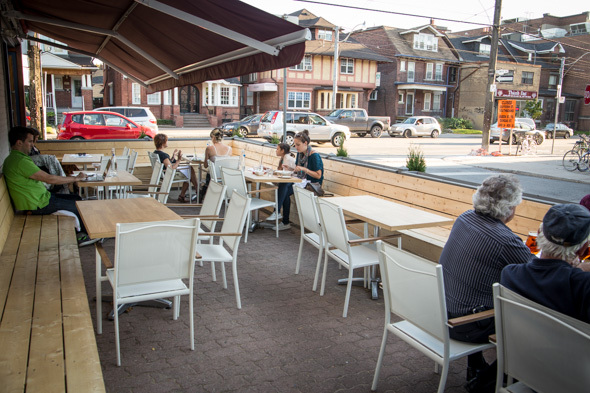 Although they have a decent-sized patio, I'm really looking forward to coming back here as the weather cools down. It's a cozy spot, and the food is hearty. It's hard to imagine them suffering the same struggles as previous tenants, and hopefully, should be able to fill the massive brunch void that Hadley's left in the neighbourhood.